Join us this Saturday, June 1st, at 2 PM to hear a fantastic line-up of poets at the Oak Forest Neighborhood Library, 1349 West 43rd Street, Houston, TX, 77018. Participating poets include James Adams, Darla McBryde, Dustin Pickering, and Charlie Scott. A WITS student also will perform, so come out and support the arts at this Public Poetry event! Public Poetry exists to bring the public and poetry community together and to create a buzz about poetry. 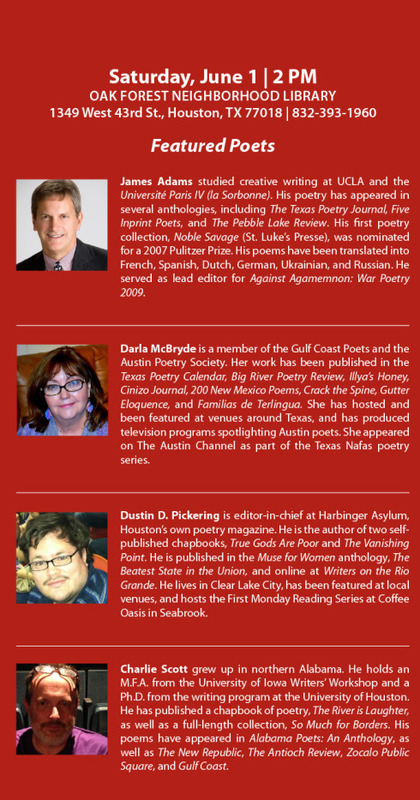 Public Poetry was awarded the Best Reading Series in Houston by the Houston Press.